A surprise inside for GA? I opened up the AOPA eBrief today to find an interesting story. 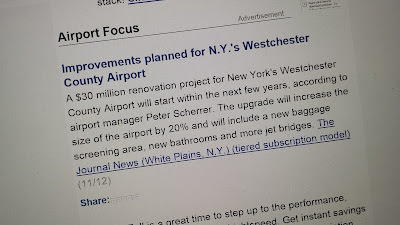 Among the things deemed most important, or newsworthy, to AOPA readers was this - Improvements planned for N.Y.'s Westchester County Airport. Sounds great, right? Scanning the introduction to the article, the teaser which comes in the eBrief, I found nothing but news about commercial airline operations. Knowing that didn't fit with AOPA's mission, I clicked the link. What I hoped to read about deeper within the article was news of relief for local GA. Why do I say relief? Westchester County Airport, White Plains to many of you, is no friend of GA. The locals hate aviation (except when they need a commercial flight), complain incessantly about aircraft noise, fought for years to keep trees from being cut off the end of the runway most often used by GA, and are generally some of the nastiest anti-aviation folks on the planet. 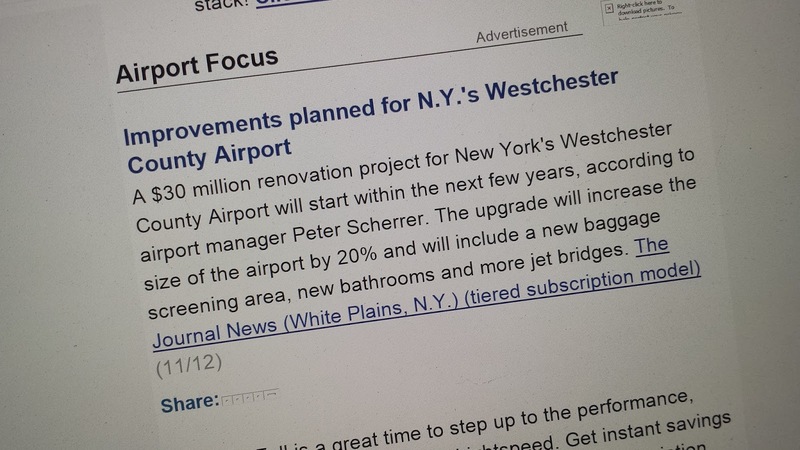 There's never good news for little airplanes in White Plains and that's why I clicked the link. What I found wasn't relief. It was dismay. AOPA actually felt this was relevant to their members. Read it by clicking here. Can someone explain to me why AOPA feels this is worthy of the eBrief? "Fiona Dogan was pleased to hear about the expansion, but also likes that the airport is "small and manageable" as it is." If you've experienced people from the area, you will easily recognize the double-standard tone and inference contained within.